When the government scrapped the super-collider project, Green took it as sign to try something new. He bought an old summer home one block off Lake Pontchartrain in the small town of Mandeville, and in 1996 opened The Broken Egg Café, the type of friendly, slightly upmarket brunch spot he’d been yearning for. It seemed other people in the area had been looking for something similar–customers happily accepted two-hour wait times at the cafe on Saturday and Sunday mornings during its first year in business. Sixteen years later, Green’s original restaurant still draws weekend crowds, as do the 20 units of his franchise, dubbed Another Broken Egg Café. While Green’s menu has 150 items, including burgers and sandwiches, more than half the offerings have one thing in common: Their main ingredient is the humble egg. A decade ago, when buffet chains, fast-food outlets and family-dining franchises were expanding their menus, attempting to cater to almost every taste, a singular focus on an item such as the egg would have seemed like a stamp of doom. But now, with the success of narrowly themed concepts like the 260-plus-unit Noodles & Company and the 126-unit Raising Cane’s Chicken Fingers (which offers only its namesake product, plus fries, toast and coleslaw), restaurants that do one thing–and do it well–are gaining traction. The secret is in picking an item with enough broad appeal and versatility to anchor a menu. PB Loco, a gourmet peanut-butter sandwich chain that started franchising in 2005, got great reviews for its unique flavor combinations. The problem was, the concept didn’t appeal to breakfast and dinner crowds; even for lunch, the grade-school staple felt more like an occasional novelty than a regular meal. The company started closing stores in early 2008. A small flurry of cereal-only restaurants opened and flamed out in the mid-2000s, going down for the same reasons. 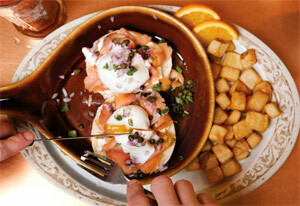 Green is not the only one who believes eggs have enough heft to take center stage at mealtime. Besides Another Broken Egg, other egg-focused eateries in the “better breakfast” category include First Watch, Mimi’s Café and Le Peep. They’ve all benefited from a breakfast craze that has made morning meals the fastest-growing segment of the U.S. restaurant industry for the last five years, according to market research firm The NPD Group. • Crisp. This New York and Philadelphia concept knows its falafel, serving the crispy chickpea patties in pita in more than a dozen variations, like goat cheese and red peppers or jalapeño and guacamole. • New York Fries. You won’t actually find these fries in New York. The popular 160-unit Canadian chain offers frites with cheese, beef, chicken or chili on top. The Egg and I works hard to keep employee turnover to a minimum; at least one franchisee claims to have not put up the “help wanted” sign for seven years. Most of the egg concepts run on a single breakfast/lunch shift, usually from opening until 3 or 3:30 p.m., so they appeal to employees who want afternoons off to watch children, or to older servers who are hesitant to deal with late-night shifts and alcohol service. The schedule also satisfies franchisees and managers who don’t want to staff several shifts or have to supervise from early morning to late at night. The other darlings of the franchise world are restaurants specializing in grilled cheese sandwiches; those eateries began popping up across the country in the last half decade. But while the better breakfast concepts have proved themselves, it remains to be seen whether consumers will be satisfied with grilled cheese at the center of their plates. Among the players in this space are Grilled Cheese & Co., with four locations in Maryland; Chedd’s, with three units in South Dakota, Texas and Wisconsin; and San Francisco-based chain The Melt, founded by Flip camera creator Jonathan Kaplan. All are focused on elevating the comfort-food staple to gourmet levels, using international cheeses, artisanal breads and add-ons such as wild mushrooms or black beans. His other caveat is that even if the public does go crazy for grilled cheese, it is a product easily co-opted by established restaurants such as Panera Bread or even McDonald’s. But what if the buzz around breakfast fades, or grilled cheese just doesn’t satisfy for dinner? Many of these franchises say they aren’t keen to expand their menus; instead, they have faith that their core concepts have enough flexibility to change with evolving tastes. “Instead of diluting our brand by offering everything, we want to concentrate on the one thing we do well, and do it better than everyone else,” says Eggfast’s Nowak, who points out that the potential for innovation is huge. This entry was posted on Friday, November 16th, 2012 at 7:43 pm and is filed under Expansion Strategy, Franchise Activity, Menu Development/Innovation. You can follow any responses to this entry through the RSS 2.0 feed. You can leave a response, or trackback from your own site.